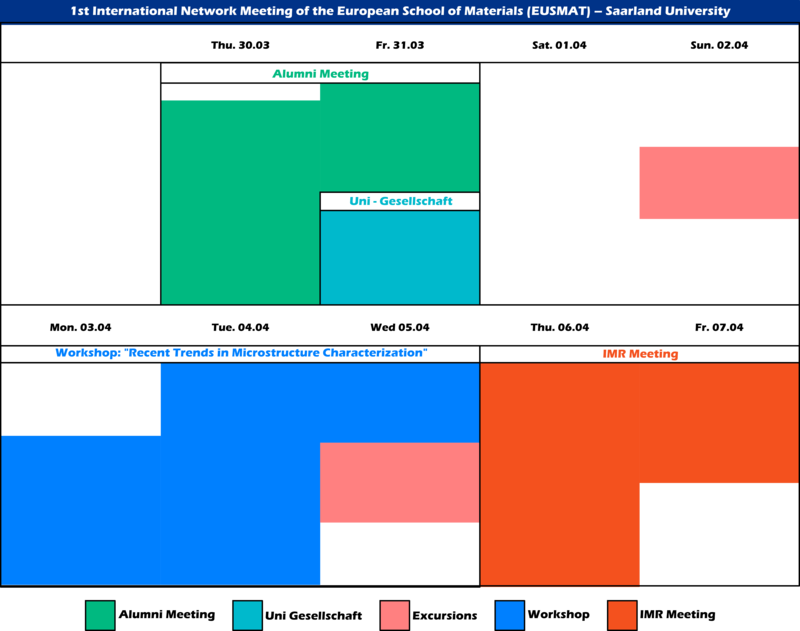 The 1st International Network Meeting of the European School of Materials includes a series of events that will take place from March 30th to April 7th 2017 at Saarland University. The overall goal is the networking between former and current students and researchers from the Materials Science Department, from the EUSMAT programs as well as from our partner universities. The first meeting should give impulse to the Materials Science and Engineering Chapter of the University Association, that will be inaugurated in this frame and should help establishing and keeping the contact with former students and researchers of our department. Alumni-Meeting: on March 30th and 31st takes place the Alumni Meeting, with the main purpose of networking among them and with students and professors of our department. The participants will have the chance to present their own current activities, which will serve as an impulse for discussions towards possible cooperation activities. Uni-Gesellschaft: Inauguration of the Materials Science and Engineering Chapter of the Universitätsgesellschaft (University Association), with the special talks by Prof. Claus Daniel (Oak Ridge National Lab) and Prof. Andres Lasagni (TU Dresden). March 31st at 17:00 hs. Workshop Modern Methods for the Microstructure Analysis : on April 3rd , 4th and 5 th prominent researchers in the field of 3D-materials characterization have been invited to give several input talks for the discussions of the different topics among all participants. IMR-Meeting International Materials Research Meeting in the Greater Region : the scientific meeting with oral and poster presentations takes place on April 6th and 7th and serve as an exchange platform among all partners of the European School of Materials. Selected contributions can also be published by the IOP-Series. FINANCING: With the support of the DAAD, the participation of 20 Alumni of any German University, that are currently active in developed countries outside Germany, and will participate for the whole event, can be financed! The European School of Materials (EUSMAT) was founded in 2008 and is located on the Campus of Saarland University. EUSMAT is part of the faculty of Materials Science and Engineering. EUSMAT supports the Department of Materials Science in working together with an experienced consortium of renowned European universities in the field of Materials Science and Engineering; operating together with a versatile network of contacts in third countries. EUSMAT is also in charge of several international study and exchange programs, such as the Atlantis Bachelor, the AMASE Master, the I.DEAR Master, DocMASE, the Create-Network and SUMA2. Furthermore, EUSMAT creates and coordinates a network with industrial partners interested in collaboration with the university network in aspects such as education, further training and qualification of international, employable leaders. accommodation in Hotel Motel One (incl. breakfast) from 29.03.2017 - 08.04.17. Details about payment procedure will be opportunely informed to the selected participants. Participants of the meeting are automatically registered (no fee required) for the IMR-Meeting and are welcome to submit an abstract for an oral or a poster presentation IMR-Meeting. All the necessary information to arrive to Saarbrücken and the University can be found on this link If you need further information how to get to Saarbrücken, please do not hesitate to contact us! We would like to thank our sponsors, without whom our meeting would not be possible.